September is gateway to the fall, and it has become my favorite month to fish. After a busy summer with the smallmouth, I take some time to relax and fish. I thought I would share two experiences, which were radically different in some ways but completely the same. Last week, I visited muskie land for a chance at a big fish. They are one of my favorite recreational species. I was fishing alone and it was extremely windy, so fishing was uber challenging in this vast, open area. After two solid mornings, several fish had followed my shiny flies to the boat, but no connection. I was beginning to wonder if I would ever catch one. After numerous casts, zilch. I texted with Jon Ray and he said “chartreuse”. I took his suggestion. Literally on the first cast, I caught the glimpse of something beneath my fly. Soon the shadow disappeared, but something told me not to rush pulling the fly out of the water. I did a figure eight with my rod tip. I had never caught a musky with a figure eight, and my expectations were low. On the beginning of the second figure eight, a wide bodied fish exploded after my fly from under the boat. Soon he was hooked! It was one of the most exciting strikes I have ever had for any species. The fish was landed–it was a good sized fish, not huge, at 36″ in length. Upon returning home, there was some time set aside to prepare for the fall season. In addition, I was hoping to accomplish one other fishing goal, to catch a brook trout in its fall spawning colors. There are numerous small creeks with brook trout in my area–in fact there is one in my back yard–so you think that this would be an easy task. This was not the case. I went to a stretch of a local small stream that is rumored to be great for brook trout. On the first day, I had several fish rise to my hopper pattern, but was unable to connect. Suddenly, a nice trout rose to my fly as it fell out of the grass on the bank. Much to my chagrin, my glee turned to horror. Normally I love brown trout, in this case I was disappointed with the 13 inch butterball on my line. I caught one more brown trout that day. The next morning, four browns as well as two rainbows we caught, but still no brookie. Finally, while swinging a wet fly, a tug registered on the line. I was frustrated when the fish was missed. The process was repeated, and again the fish took. I missed him yet again! I surmised that this must be a brook trout, as a brown trout would never be this stupid. On the third cast, I watched this nice trout follow my wet fly and it took. After a brief struggle, an 11″ jewel was at my feet. This moment was just as thrilling as catching the musky. Fishing is always fun. Challenging fish make it more rewarding. This sounds like something a guide would say but the fish that you work for really are the most memorable. During the month of September, there are many challenges for the willing angler. Whatever fish you prefer to catch, get out and enjoy this great time of the year! Amazing images Kevin. 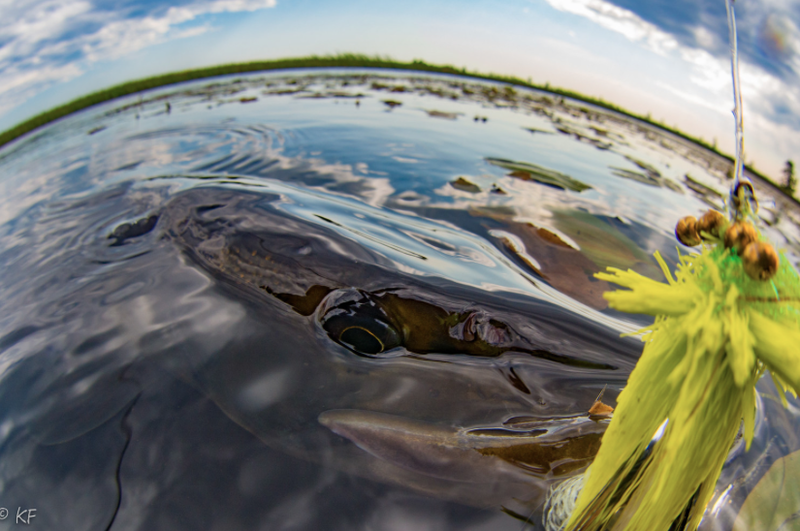 Great story about the Muskie and glad that I could help with the hot fly color.